Magic Green Ultrasonic Concentrate 10 lbs. Space age ultrasonic cleaning concentrate, no ammonia, freshly scented. Cleans all precious metals, diamonds and stones. 10 lbs. makes 160 gallons. Magic Green Ultrasonic Cleaner Concentrate. Industrial strength, space-age formula for gold and silver. 10 lb. bucket. Cas-Ker is a distributor of Magic cleaning solutions for professional jewelers and watchmakers. 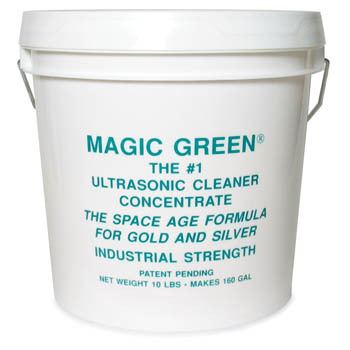 Try Magic Green Ultrasonic Concentrate for your next ultrasonic cleaning project. Cannot be shipped by air. Ships via UPS Ground only. Additional shipping charge applies.